FOLIO Sutton Coldfield were able to purchase resources for a free Lego club, thanks to a donation from Midland Expressway Ltd (MEL), operators of the M6toll, through its social committee, which provides funding for projects in the local community. FOLIO Sutton Coldfield is made up of local residents who want to see their library thrive at the heart of their community. The group raise funds to host events and facilitate projects that support public libraries in the area. Following consultation with Sutton Coldfield residents to understand what they felt was missing from their local library; the group found there was high demand for a Lego Club, which could also provide sought after volunteering opportunities for teenagers. Local mother and MEL Social Committee member, Jo Brett suggested FOLIO apply to the M6toll for funding to support this project. The application was successful and MEL donated £968 for the resources needed to start the club. The Lego club is already a huge success for the library and will be running one Saturday a month throughout 2019. With the resources, FOLIO have also started a Lego Club for children who are home-schooled which will run fortnightly at Sutton Coldfield library. 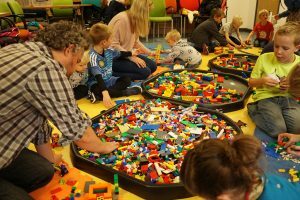 Zoe Toft, Chair of FOLIO Sutton Coldfield said: “We were thrilled when the M6toll Social Committee awarded us a grant to enable us to set up a regular Lego club in Sutton Coldfield library. “We knew it was going to be popular – and indeed all our sessions up till Christmas were fully booked within 24 hours. It’s brilliant for us to be able to offer another family activity in our much loved local library. Our Lego clubs not only feature building, creativity and lots of laughter, we have plenty of Lego books to browse and borrow too. I’d just like to say a massive thank you to the Social Committee of the M6toll for making this possible”. MEL Social Committee member, Jo Brett said: “I encouraged FOLIO to apply to the M6toll Social Committee for funding after seeing how much work they do in the community. Its lovely to see them attracting more visitors to Sutton Coldfield Library and encouraging local families to use the services available to them. The Lego club has been immensely popular so far, and I’m sure it will continue to grow”. MEL’s donation forms part of a wider initiative to support local schools and community projects. MEL’s Social Committee work closely with members of staff to choose those community projects close to their hearts which will benefit from a donation from the Drive for Charity fund.